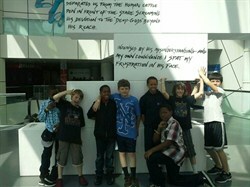 The Greenview National Elementary Honor Society teamed up with STEP UP and enjoyed a trip to the Rock and Roll Hall of Fame. NEHS is a group of outstanding fifth and sixth grade leaders for the Greenview Community who worked hard on many outstanding causes this year. Efforts included a Valentine's Day Pencil Gram fundraiser, running the ARCSmart Store, collecting food for the local food bank, volunteering a minimum of 20 hours yearly and many other wonderful deeds! STEP UP was fortunate to team up with this group and enjoy the enrichment opportunity to learn about the Science of Sound. This presentation, Rock Your School, is part of the cooperation between the Rock and Roll Hall of Fame and local schools. The students enjoyed this fun and educational learning opportunity.